I love soft pastels, creamy whites, chocolate browns, dove grays . . . they feel so warm and comforting to me. I feel enveloped in softness and luxury when I wear them and when I'm surrounded by them. 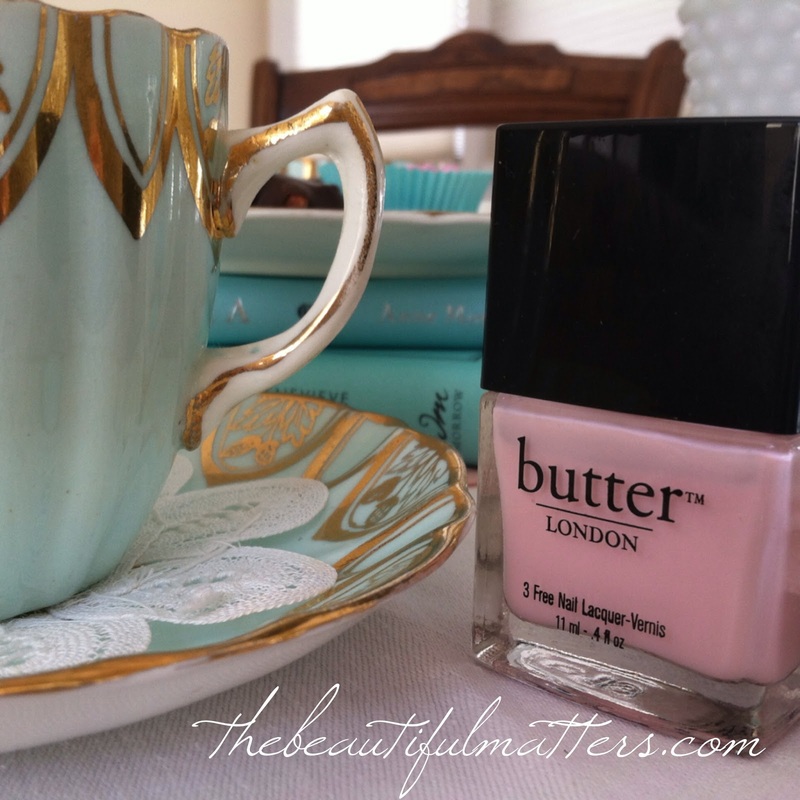 I embrace a more subdued palette in my clothes, my makeup, my home decor, and even my china. 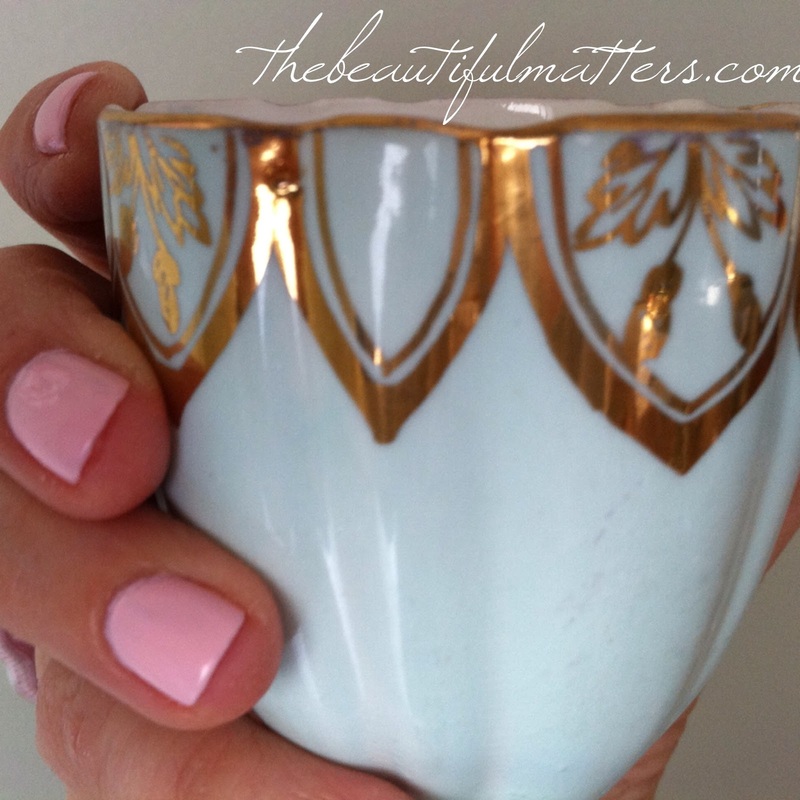 I was thinking of my preference for soft, muted colors as I pulled out these beautiful aqua blue teacups and saw how nice they looked with my nail polish. Love this combination . . . I rarely use these cups because they are so very old and delicate. They belonged to my great-grandmother's oldest sister Margaret, born in 1870. She came to the U.S. from Scotland as a young married woman, and, tragically, had to bury her two-year old at sea on the crossing over. I have never been able to forget that story, and wonder how she coped with her loss. I have two oil paintings she did that I love. I'll do a post about them some day. My mother bought these little lace doilies in Belgium when she was on vacation there in the 70s. I have six little ones and one larger one. I am wearing Butter London's Teddy Girl. I love the color, but it is streaky and requires three coats to adequately cover. Three coats takes a long time to dry. A good alternative, which I don't have, is OPI's Mod About You. I got a pedicure with it last summer, but haven't been able to find it in stores. Think I will order it. It is the same white/pink shade as this Teddy Girl. Just one pecan turtle left from Valentine's Day. It came from a little store in our small town. It's made here in Michigan. We also picked up some salted caramels in dark and milk chocolate. So delicious (they've disappeared). Whoever came up with this caramel/salt/chocolate thing . . . all I can say is, thank you. So good. I also included a few pink and white M&Ms left over from Valentine's Day. 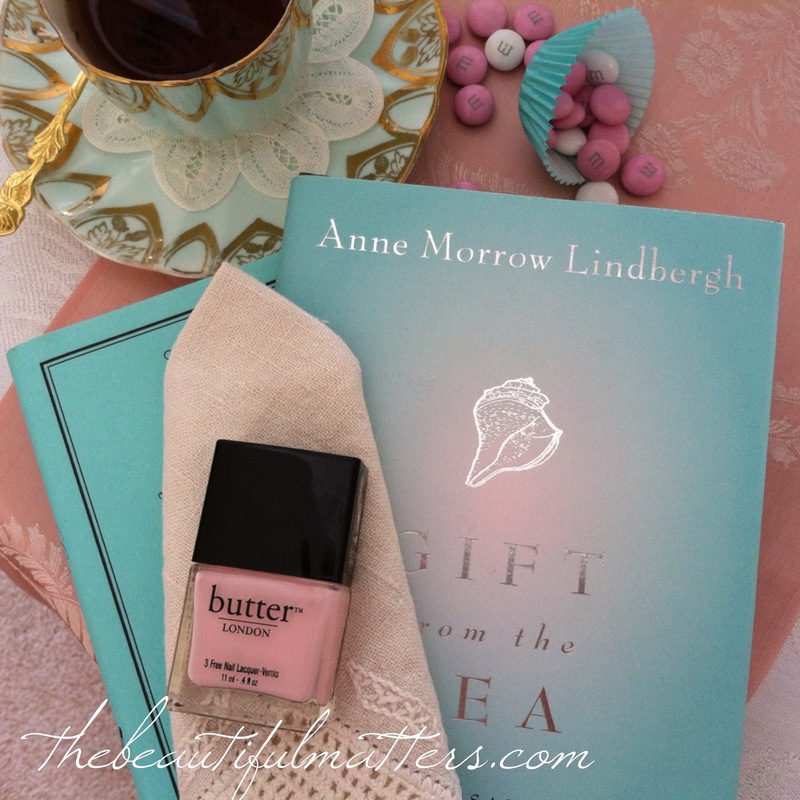 In keeping with my pink and aqua theme, I pulled two books with pretty aqua covers off my bookshelf, A Guide to Elegance and Gift from the Sea. Both are good for dipping into and perusing with a cup of tea. 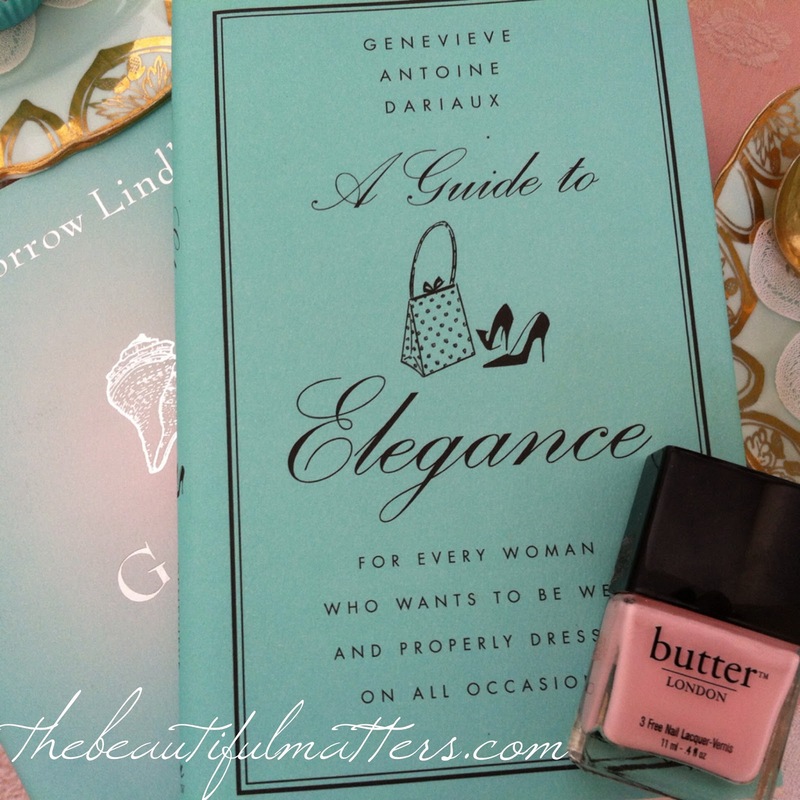 A Guide to Elegance was written in 1964 by Genevieve Antoine Dariaux. It is quite dated, which makes for an interesting and fun read, but some of her thoughts about elegance are still spot on. Aren't these colors beautiful together? These beautiful pink roses were on sale after Valentine's Day for $5.99! 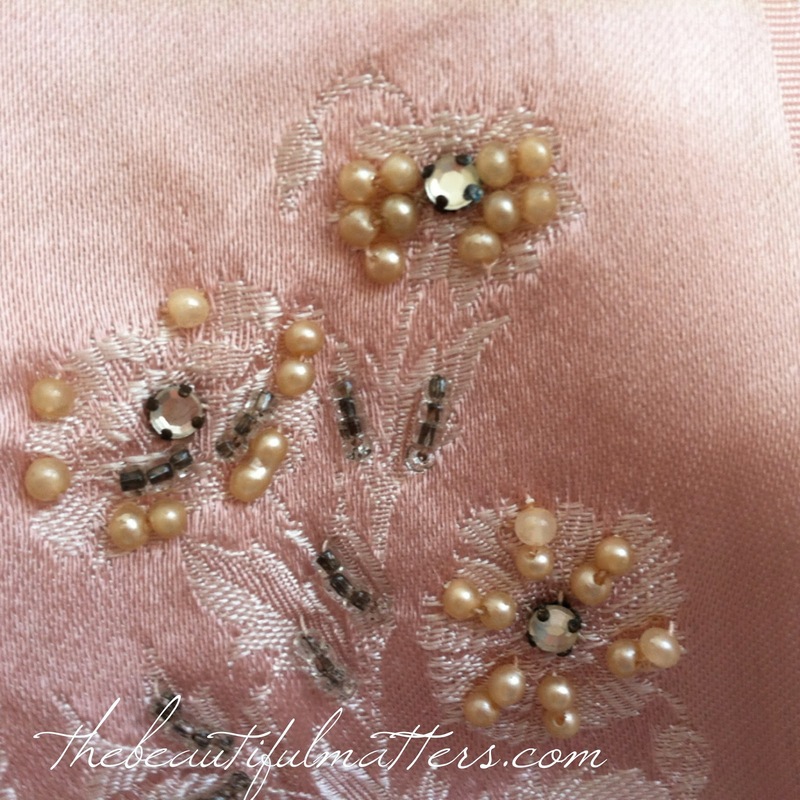 This is some beading detail on the pink silk scarf I put over my tea table. I found this little lovely on Ebay. As I drink my tea and enjoy the soft, beautiful colors, think over stories of those long gone, and enjoy reading, I once again realize that tea time is so much more than the actual physical refreshment. It's a time to appreciate beauty and loved ones, to think creatively about our lives, and to imagine the past and future while fully enjoying the present. I am linking today with . . .
What a beautiful pattern and a lovely post. Elegance is certainly your forte. Looks like we are both enjoying our tea this morning! 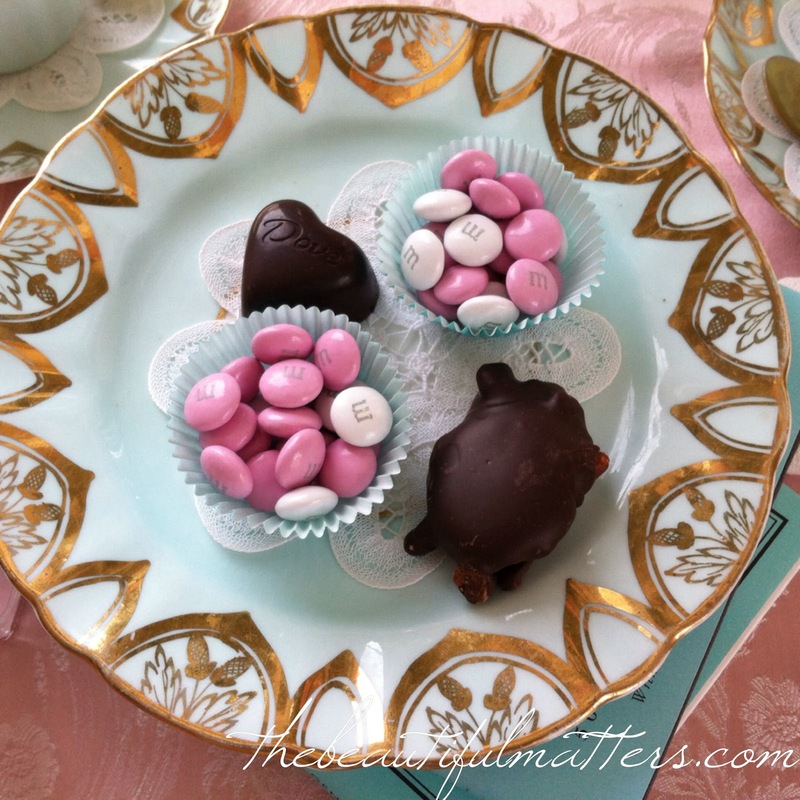 So enjoyed this very pretty post on pastels and your lovely Valentine's Day vignette. Yes, the colours are all so beautiful together, the pinks playing off the aqua, in the book on elegance, (very intriguing! ), the M & Ms and the roses! Thanks for sharing! Pink and aqua is my favorite colour combo! The teacup is just beautiful and such a treasure. Our ancestors endured such hardships and when we stop to ponder them, makes us very thankful for the lives we are blessed with. Your roses are gorgeous and a good bargain too. Thank you for sharing this with Tea Time and have a delightful day. What a lovely post, Deborah. Your nail colour is so pretty. I really like OPI polishes and will keep "Mod About You" in mind. 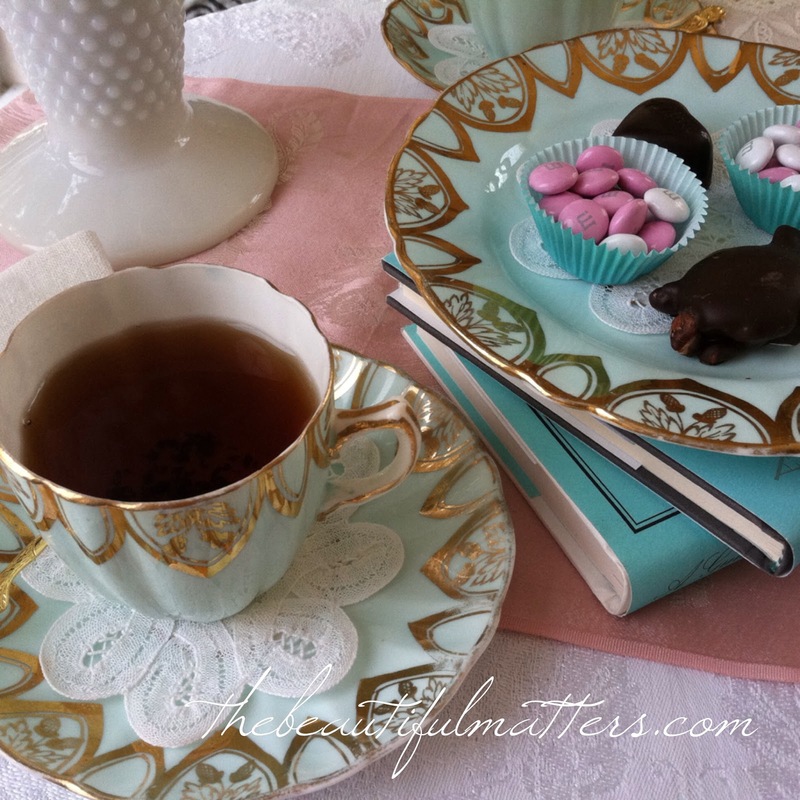 The teacups are so delicate and the story behind them makes them a true family treasure. I look forward to seeing your aunt's paintings. 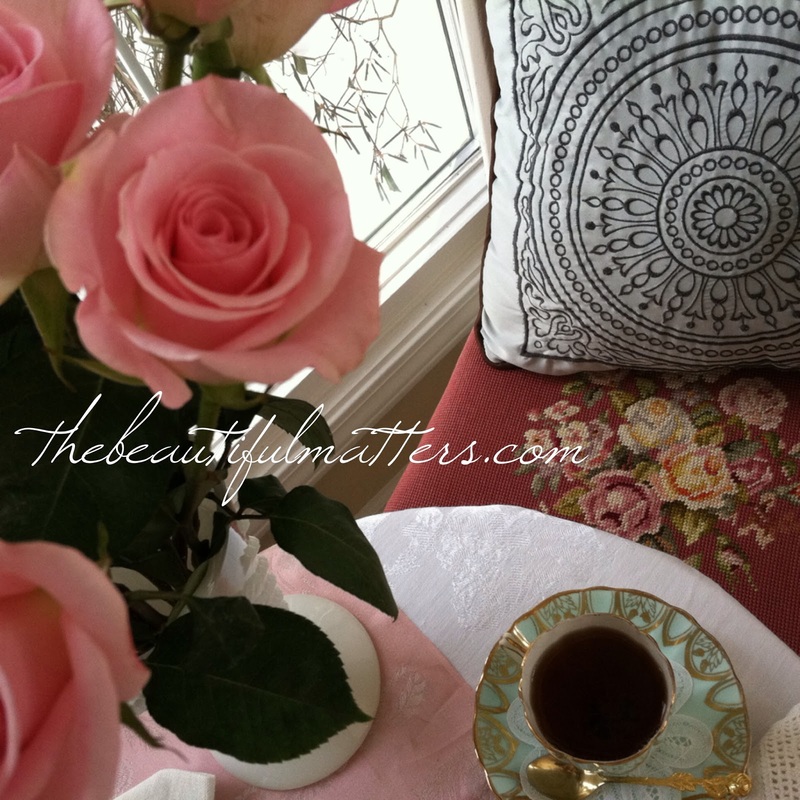 The pink scarf on your table is just lovely...what a wonderful spot for tea. Isn't it wonderful when you find flowers, especially roses, on sale? I've seen "A Guide To Elegance" on amazon and have thought about ordering it. I'd love it if you could share some tidbits from this book. Thanks again for sharing so much loveliness with us. Each of your posts are a delight! You're so sweet Sandra. Thank you. I'm a person who likes pastel colours too and find the combination of pink and aqua together quite appealing. It would be terrible to lose your child on an ocean crossing, tragic under any circumstances and it would take a strong woman as she journeyed to a new country. The pink nail polish is pretty, and I like the OPI brand as well. The pink and aqua are indeed beautiful together. Your nails are very pretty, Deborah. Your goodies look yummy and the teacup is lovely! What a rich combination of aqua and gold. 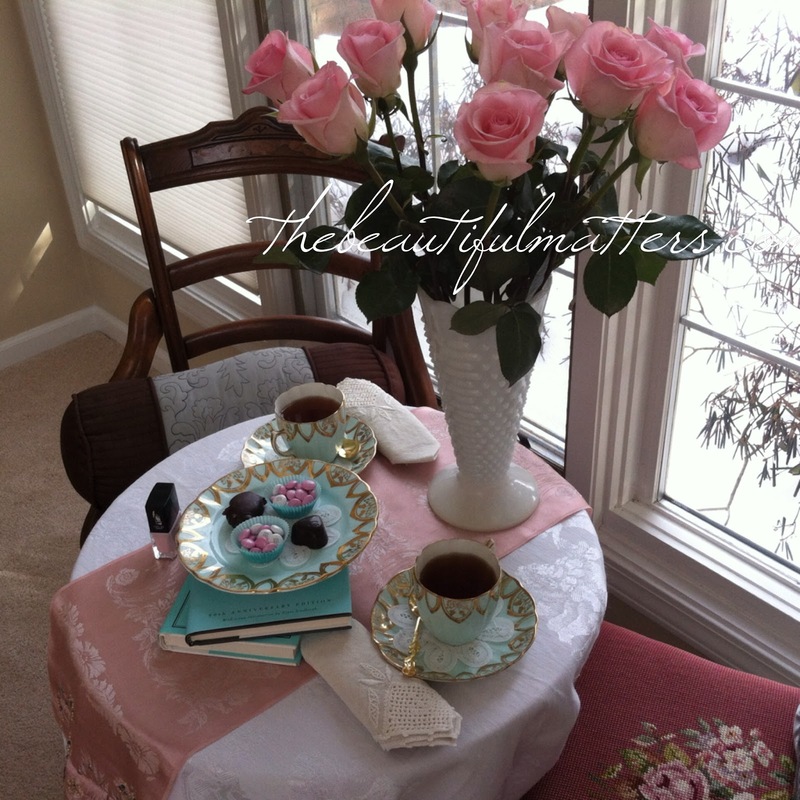 The cups and plates are so elegant and the combination with pink is dreamy. The story of crossing the sea and loosing the baby is heartbreaking. I find it incredible that the china made the crossing too and still is here to carry on that story. That is a beautiful thing. thanks for stopping by Ruthie, and your lovely comment. I love your tea setting in aqua and pink. The colors go so nice together. Its wonderful that you own this heirloom from your aunt. The story of the young mother is really touching. We can only imagine how hard it was to immigrate by such examples. Life was cruel. And so helps the inherited cup to remember the ancient. Thank you for this interesting tea time and for your lovely comment on my blog. What a sad story about your aunt and yes, I heard stories like that happening from hubby's uncle who came from Spain; people endured such hard ships in those days. The teacups are stunning and what history they have, this makes them so very special. I don't blame you, just take pics of them for us, as they're a treasure, heirloom. Love the pinks and pink nails too! Thank you for visiting me, sorry I've taken a while visiting. I love your blog. I will follow you now. Hope you want to do the same. Have a lovely week. 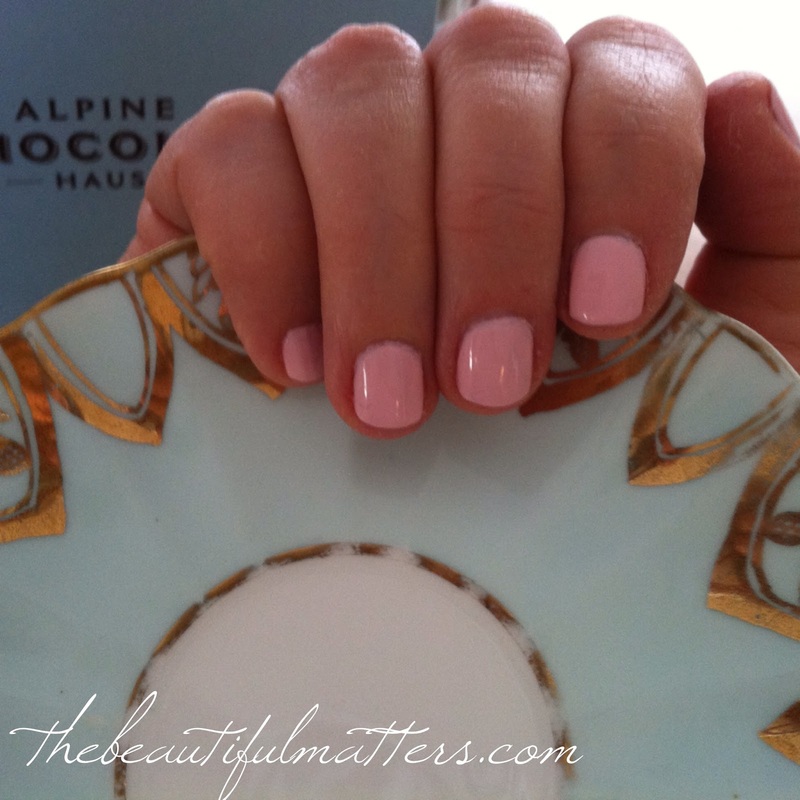 I love that you can match your nail polish to those beautiful dishes! You ROCK...heartwrenching story about your Great-Grandmother's Sister, but I love that you have the plates from her. Happy Tuesday - hope your week is beautiful! :) thanks Tanya, you too! The story of your young ancestor who came from Scotland and suffered such a tragedy during her trip. It hurt my heart to read about it. Having plates from her means you will never forget. Beautiful shade of pink! I would love to have you join us tomorrow for our linky. I have a special surprise planned for the party. I am looking at my battered nails now, and wanting to do a mani. Thanks for the inspiration. thank you Mindie. I will look up your blog. I'd love to have you join me at Seasonal Sundays. I enjoyed your reminiscent thoughts and poetic sentiments. Oh and the photos are great. Great idea of your nails w/the dishes. Thoroughly enjoyed my visit. Happy Pink Saturday!